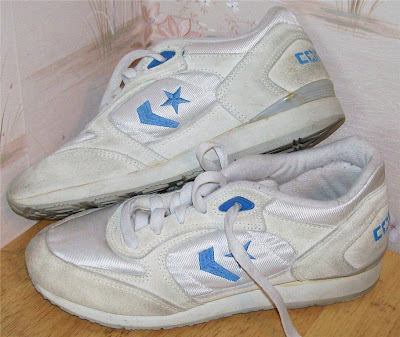 The Converse Blog: The Converse Blog's Friday Flashback: Jogging. This time tomorrow I will be rocking out with NEEDTOBREATHE. Which means I'll be doing a lot of standing and walking around Ichthus Festival. I've even had to run a few times to make the start of a concert. So I thought I'd I bring a walking/jogging/running shoe today. They're simple in a nice white/blue colorway. 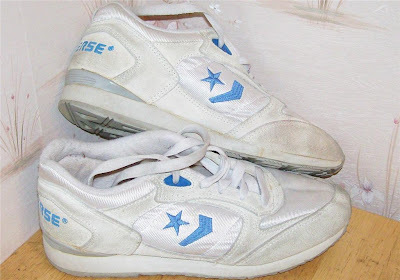 They're appear to have an upper of suede and nylon. I hope I was able to catch the game last night, but I don't know yet. Either way I'll be Weapresenting Boston. Thanks for checking out the blog and remember the vote on your way out.